Picea Glauca Conica is the botanical name for the miniature, cone shaped evergreen tree commonly known as the Dwarf Alberta Spruce. It is one of the most popular spruces, often used for live Christmas tree because of its almost perfect conical habit and sheared look. Foliage color is medium green with a slight bluish cast. Slow growing at about 3 to 4 inches a year. 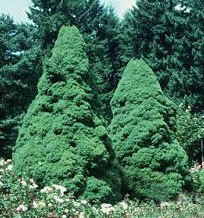 It will reach 10-12 feet in 60 years, but growth from 6 feet to maturity is very slow at about 1 to 2 inches per year. This is an excellent plant for miniature gardens. 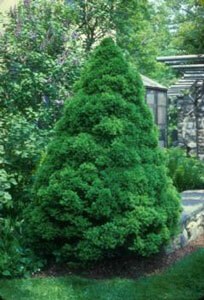 It is excellent for group plantings where its natural shape can be maintained. Suggested uses for this plant include specimen plant. Maintenance sometimes needed to control red spider mites. Water young plants weekly in hot, dry weather. Place hose at base of plant and let water trickle into soil until thoroughly soaked. Water well in the fall to reduce winter damage. Red spider mites can be a problem in hot, dry weather.